Parents with a child who have been diagnosed with behavioral or mental challenges know that navigating through the system of government and state care can be an intimidating task. Thanks to community donations, we’re able to guide parents to receive the help they need. Ohana Support Services (OSS), which started in September 2015, is designed to educate and empower families who may have children with a mental health disorder diagnosis or behavioral issues. If you are enrolled in OSS, you are connected with parent partners who help families access CAMHD (Child and Adolescent Mental Health Division) and DOE (Department of Education) resources, facilitate support groups, educational workshops and encourage positive parenting skills and collaborative relationships. What’s truly unique about OSS is that these parent partners are not only certified in what they do, but also have experience as a parent/caregiver themselves, helping their child navigate the mental health or special education systems. Whether it’s helping with everyday needs like paperwork, transportation and housing, or providing encouragement and support during school meetings with psychologists and counselors, these parent partners provide assistance towards meeting the family’s goals. 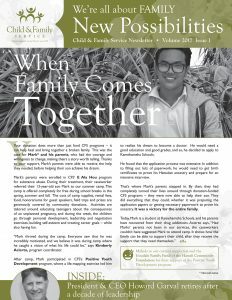 Lelani, a caregiver who received help from OSS, says that her parent partner Pualani Basbas played a vital role in helping her care for her grandson, who has mental health issues.